Omega will once again supply James Bond’s wristwatch in the upcoming film Spectre due out in November 2015, but in the meantime Omega introduced the Seamaster Aqua Terra >15,007 Gauss SPECTRE at Baselworld 2015. The Omega marketing machine generally rolls along slowly and conservatively, leaping into action each time a global event Omega sponsors takes place. This includes the Olympic Games, anything to do with NASA and the Moon, and of course, James Bond. Come November 2015 Daniel Craig will return as James Bond in Spectre, with an Omega on his wrist, probably a Seamaster 300. 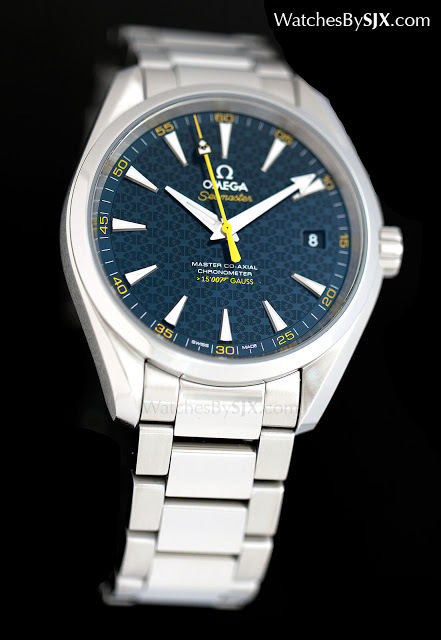 However Omega already introduced the first Spectre watch at Baselworld: the Seamaster Aqua Terra >15,007 Gauss SPECTRE. 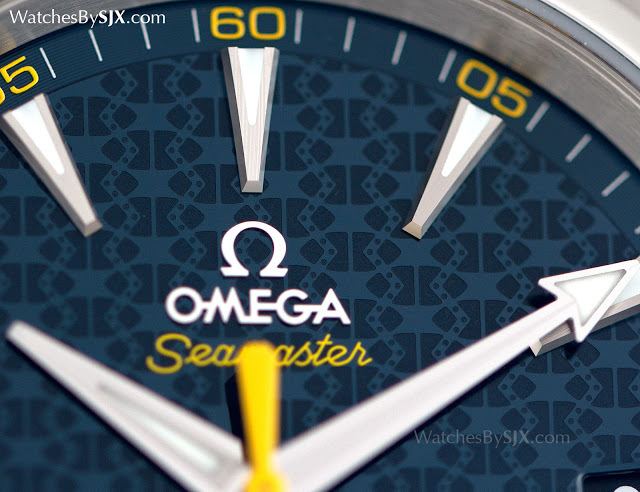 Typically Omega approaches James Bond related branding with a heavy hand, emphasising the “007” logo on the dial (the Seamaster Skyfall is an example). The Spectre Aqua Terra is more restrained, using the Bond family coat of arms as a recurring motif. Comprising of three gold coins on a chevron, the Bond coat of arms forms the tip of the seconds hand, as well as a subtle guilloche for the dial. A deep, slightly metallic blue, the dial is stamped with the coat of arms decoration, allowing it to catch the light at certain angles. 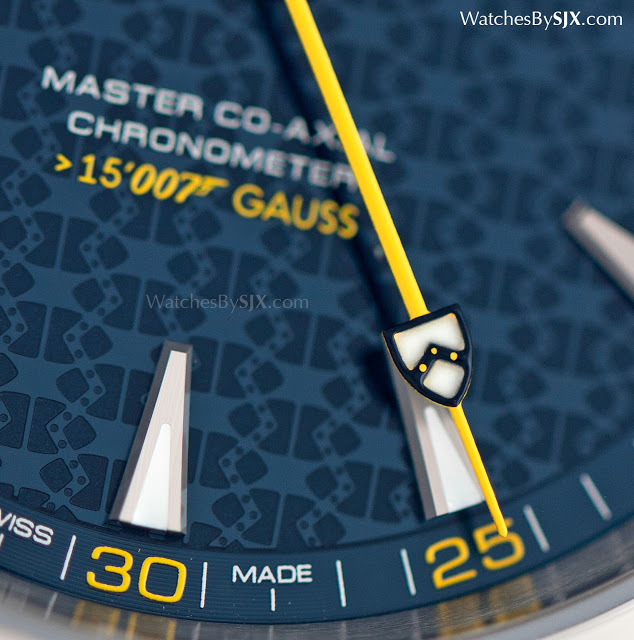 The designers could not omit “007”, so it is integrated into the “>15,007 Gauss” at six o’clock, a relatively subtle logo. 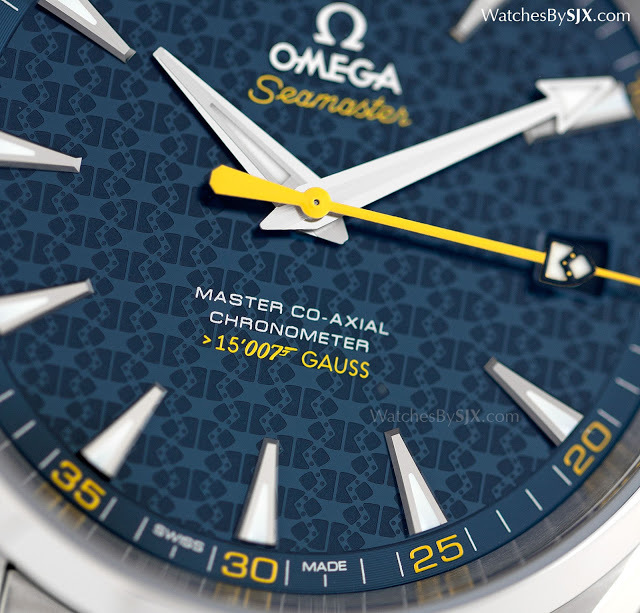 By comparison, the equivalent Aqua Terra model in the regular collection is labelled “>15,000 Gauss”. 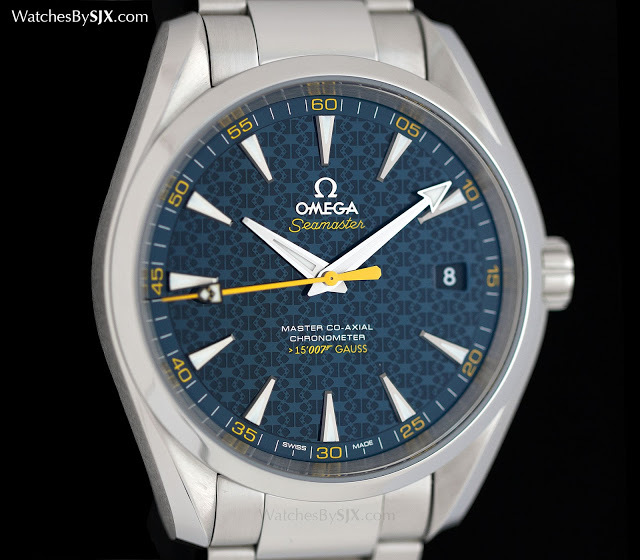 The rest of the dial is similar to the standard Aqua Terra. The hands and hours markers are diamond-cut, giving them precise, sharp edges, the most obvious example of the improvement Omega has accomplished in its dial construction in recent years. Like other Master Co-Axial watches the Aqua Terra SPECTRE has a display back, not requiring soft iron shielding thanks to the silicon and patented alloy components inside. 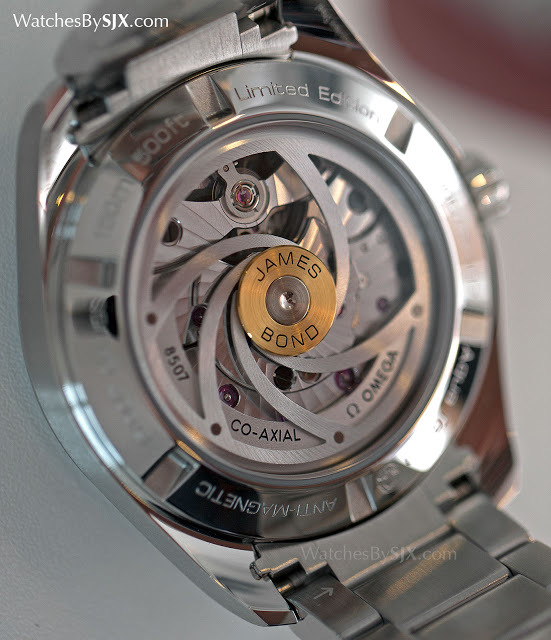 The rotor is styled like the inside of a gun barrel with a bullet at its centre, a nod to the signature sequence found at the start of every James Bond film. The Seamaster Aqua Terra SPECTRE is priced at SFr6100 or S$9500, and available starting July 2015. Another Spectre edition identical to the watch Bond sports in the film will be unveiled when the movie premieres in November 2015.